Those fountains were beautiful, but they were also psychological warfare. 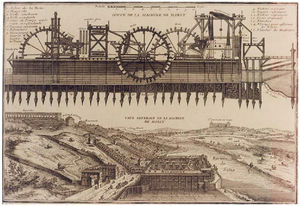 La Machine de Marly's array of 14 water wheels, each measuring 12 meters in diameter. The rocker arms driven by the wheels, which powered pumping relay stations up the hill, are seen at the upper left and center. Throughout history, rulers have felt it necessary to create tangible displays of their wealth because wealth bought the power that impressed allies and intimidated enemies. We know of numerous examples in the ancient world, most of which have fallen into decay and are now gone. An important one that may still be seen - and is still overwhelming - is the temple complex at Abu Simbel in Egypt. That was built as the first evidence of the pharaoh's might that a delegation from Nubia would see as it paddled north on the Nile and crossed into Egypt. It was built by Rameses II during the 13th century B.C. The wish to impress state visitors who arrive by water has examples in modern times. The Peterhof castle built in 1714 by Peter the Great of Russia was intended to awe state visitors who arrived from the Baltic Sea by canal. Russia was looking to the West, and the message of the castle was that Russia was powerful and just as European as any other country on the continent. The castle also shows that architectural gamesmanship had reached some limit of size and elegance by the 18th century, and another dimension was needed to demonstrate a monarch's ability to expend unlimited resources for his own amusement. Numerous elaborate water spraying fountains filled that need perfectly. Not only were they aesthetically pleasing on palace grounds, but they also were immensely costly. As impressive as they still are, Peter's fountains were not unique. They were copies of the fountains that had been placed years earlier by Louis XIV at Versailles, a site 12 kilometers southwest of Paris. Louis might be accused of delusions of grandeur because he chose to identify himself with Apollo, the sun god; for that reason, he is still referred to as the "Sun King." On the other hand, perhaps his delusion was not total. He had an unusually enlightened reign, which was also the longest in European history. Sadly, his reign was the beginning of a final decline. His fountains were artistic triumphs; conceiving them was, no doubt, a work of genius. And Louis did not have the advantage of terrain, which later allowed Peter to use water brought by gravity from stream-fed reservoirs. Louis had to pump the water mechanically. That he was successful in his effort to use technology for personal aggrandizement was best summed up by a sycophant, who remarked that only such a monarch could move a river to the summit of a hill and make it flow. It may have been paid for by Louis, but it was accomplished by sheer manpower and pump technology. The hardware was on a far larger scale, but even more primitive, than the first attempts at a steam-powered pump being made by Thomas Newcomen around the same time. Louis's display of conspicuous consumption did not impress all of the king's peers. The king of Denmark observed, in what was probably an understatement, that the water pumped to the fountains cost as much as wine. Water for Versailles was taken from the Seine, raised, and distributed by high stone aqueducts and pipes. Pump power was provided by 14 water wheels, each 12 meters in diameter, driving a total of 257 pumps. The most remarkable aspect of this array was that the wheels not only drove directly connected piston pumps but also transmitted power 650 meters up a hill and drove other pumps, which relayed water from intermediate sumps at 200 meters. The means by which power was transmitted to the remote pumps was a striking example of brute force-and ignorance engineering. It is more interesting than the pumps themselves. In addition to driving the local pumps, the water wheels, by means of a bizarre assortment of levers and bell cranks, provided an oscillating pull to pairs of chains that relayed power up the hill. Chains were supported at close intervals by centrally pivoted struts mounted on scaffolding. In all, there were 20 parallel pairs of chains running to a relay station from where another 13 pairs continued to a station at the top. Almost 20 km of chains were involved. This was broken into modules, where chain segments were spaced approximately 4 meters one above the other and supported on spreaders at roughly 5.5-meter intervals. Numbers are approximate, but this calculates to a total number of supports on the order of 2,000. In addition to the central bearings, which held the full weight of the chains and wooden rocker arms, smaller secondary bearings, top and bottom, linked the arms to the chains. While operating, the array use have resembled a surrealistic, slow-motion race up the hill by teams of tall picket fences - about four meters tall, in fact. The assembly was completely exposed to the elements. In view of the forces involved and the clearances between unshielded components, it is probably just as well that there was no 17th-century equivalent of OSHA in France. This entire "Machine" was a product of the nobility and it surfaced occasionally in French history. During the succeeding reign of Louis XV, Madame du Barry complained about the noise it made. Given the state of bearing technology and the number of bearings - something like 2,000 main bearings in the rocker arms plus another 4,000 top and bottom - this is understandable. The Machine was the creation of people who, like du Barry, lived in a culture isolated from realities like bearing friction and were probably troubled by an occasional squeak. The idea had been sold, if not really conceived, by a nobleman who had high aspirations. He was Baron Arnold de Ville of Liege, who had, on his estate, a pump that could be regarded as a small-scale, proof-of-concept model. When he arranged a demonstration of a similar pump for the king, the concept was accepted with regal enthusiasm. No doubt de Ville won the status he sought, although it's not clear that he really deserved credit for the finished product. He was, however, awarded a life time pension and a small chateau on the site of the Machine. It was this chateau that was later expanded and given to du Barry by Louis XV. De Ville had an associate, Rennequin Sualem, who is described as a "carpenter" and it was this subordinate who did the work, in the same way that the man who later designed much of the U.S. Capitol building was brushed off as a "draftsman." The mechanism by which suction pumps worked had been well explored by the late 1600s, starting with the work of Evangelista Torricelli. Large-capacity pumps were not a novelty. In 1698, Thomas Savery in England was already producing pumps to evacuate water from deep mines. The pumps that drew water from the Seine were not particularly interesting from a modern standpoint. They were conventional piston pumps with leather packing and their only striking feature was a very large stroke-to- bore ratio. The pumps were arranged next to seven of the wheels in two groups of four. The other seven wheels were devoted to powering the remote pumps up the hill, using the chain and rocker arm system. The entire factory of water wheels was installed on the bank of the Seine in 1685 and has always been referred to as the "Marly Machine." The name may derive from the village that stood there, although the construction was large enough to involve the town of Bougival at the river end and Louveciennes at the top. 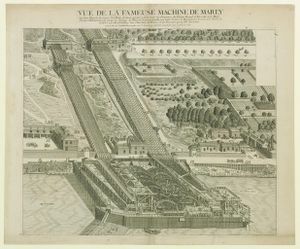 It may refer instead to the Chateau de Marly built by Louis about the same time as the Machine. The Machine is the subject of numerous drawings, both artistic and technical, which survive to this day. When operating, the 14 wheels delivered a maximum of 5,000 cubic meters of water per day to a reservoir 162 meters above the Seine. Assuming that this Machine could not have had an overall efficiency of more than, say, 10 percent, the array of wheels must have produced a maximum power on the order of 1,000 kilowatts. That was an impressive number for 1685, even though the pumps normally operated at only 50 percent of full power due to co-maintenance issues. The number of workmen involved in construction was staggering. A total of 1,800 men worked for seven years. There were enough of them to warrant their own chapel on a site that also included two foundries. A dedicated water supply was needed to bring in potable water, the Seine not being drinkable. When the Machine was finished, it required a team of 60 workmen just to keep it running. Another idea of the magnitude of the undertaking can be gleaned from a bill of materials that included 850 metric tons of steel and lead, 17,000 tons of iron, and 85,000 of wood. A commentary on bearing technology is that 12,000 pounds of tallow were required as a lubricant. The entire operation cost the equivalent of something between six million and 10 million euros. Versailles and its fountains were no doubt successful as instruments of international policy. Any foreign delegate could not have failed to have been impressed by the sheer purchasing power of the French regime. That could have meant a lot of soldiers and a lot of armament. In the end, such displays were self-destroying; they proved to be the death warrant for the French monarchy. A hundred years later, during the reign of Louis XVI, the French people became saturated with royal extravagance and a revolution began. The Chateau de Marly has disappeared. The works of the Machine are also gone. The power of monarchs fades - French or Egyptian. Rulers, feeling the need to intimidate their competitors with architecture, have had an edifice complex since time immemorial. This page was last edited on 31 May 2016, at 13:25.